The savage Tory cuts to local council grants has hit Labour-run Reading harder than our neighbouring Tory councils. Reading has lost more than twice as much money per person than Wokingham. The Tory government are continuing their unjustified and savage cuts to local authority budgets. Funding has been slashed in Reading by £237 per resident, forcing reductions in key services. 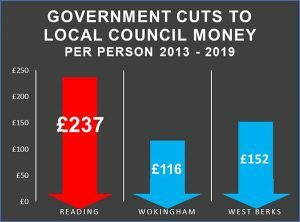 Reading’s Labour Councillors endeavour to protect as many local services as possible, but the Tories refuse to recognise the effect their cuts are having on communities. Compounding the issue for some residents is the rushed roll-out of the poorly devised Universal Credit system in Reading, which Matt Rodda has slammed for its ‘deep flaws’. Labour strive to protect library services in our town, but the scale of the cuts mean that opening hours have been re-duced and we also have to look to external partners to en-sure provision of new swimming pools in Reading. Similarly, we remain committed to protecting our vulnerable residents even as the Tories show no willingness to properly fund the increased demand for children’s and adult social care.